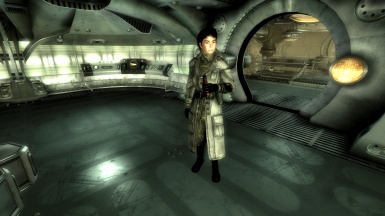 Fixes both the coat and the holotape found in the Anchorage quartermaster shipment box. 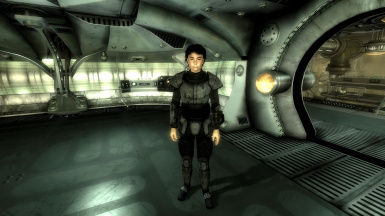 Also restores the Winterized combat armor that was supposed to be found inside. Everyone knows about this odd little bug. You happen to stumble upon a shipment box that's supposed to have the Overcoat you couldn't get during Operation Anchorage and a note explaining how it came to be. 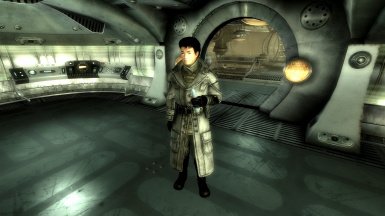 To our dismay, all we find is a broken holotape and an item claiming to be "General Chase's Overcoat" yet its really just a standard issued winterized combat armor. Apparently theres two different armors, one that has the right textures but wrong stats and the other thats called "General Chases Overcoat" yet it has the winterized combat armor textures...somethings not right here. Heres the list of changes I've made that will fix everything. Fixed the broken holotape. It was set to the wrong speaker, changes it from "DLC05holoNPC1" to "DLC05holoNPC2" . Adds the real Overcoat. 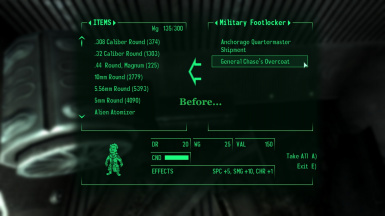 Updated its stats which were set to Colonel Autumns Outfit to the proper ones. 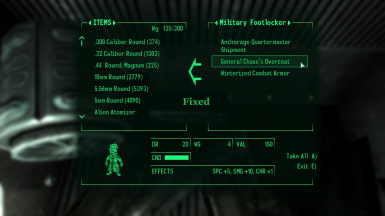 Changes the fake suits stats and name to Winterized combat armor.